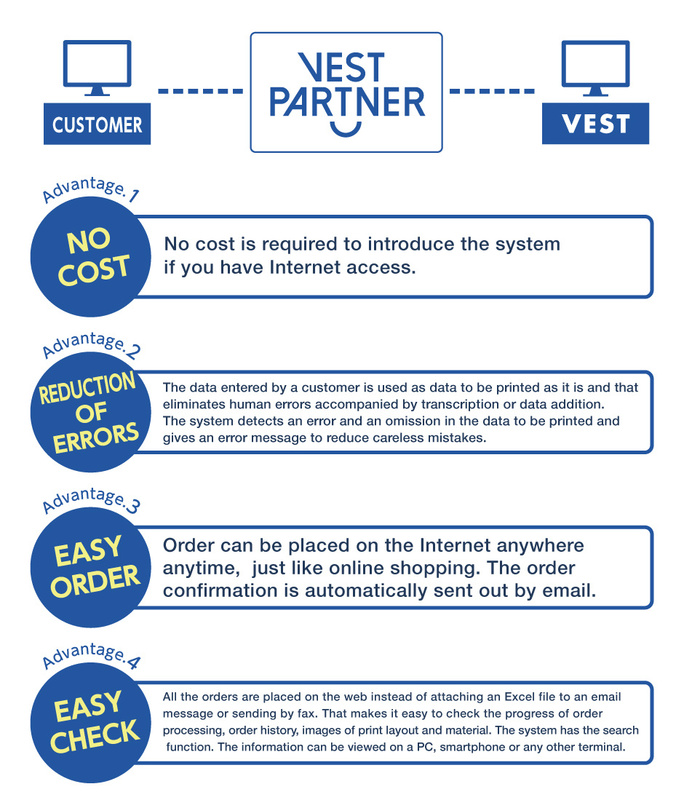 “Vest Partner” is an online ordering system for apparel accessories. No cost is required to introduce the system if you have Internet access. All the orders are placed on the web instead of attaching an Excel file to an email message or sending by fax. That makes it easy to check the progress of order processing, order history, images of print layout and material. An order can be repeated easily using the search function. When changes are made in an order sheet, a new sheet does not have to be issued. It can be updated online. That reduces time and labor needed for preparation of order sheets and order management. The data entered by a customer is used as data to be printed as it is and that eliminates human errors accompanied by transcription or data addition. The system detects an error and an omission in the data to be printed and gives an error message to reduce careless mistakes. Try the “Vest Partner,” a much easier and more accurate order management system than the conventional ordering method.